The safety of the people we work with, their families and neighbours, is a shared core value for our company and the communities where we work. This is why we are proud to work with local first responders, to help provide a safe environment in our operating areas. Every year, we support fire departments and their exceptional work in these communities, by contributing to efforts focusing on updating facilities and equipment, and enhancing training and emergency services for the long-term safety of community residents. 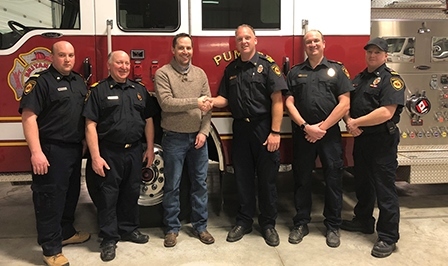 We also contributed towards a fire truck for the Macklin & District Volunteer Fire Department, and helped the Lloydminster Rescue Squad purchase an underwater remotely operated vehicle. In October 2017, raging grass fires affected southern Alberta and Saskatchewan. Canadian Natural donated funds to the Hilda & Community Association to assist the victims of the wildfires. We also contributed auction items to the Fox Valley Volunteer Fire Department fundraiser dinner held in honour of injured and fallen firefighters. Other Fire Departments we supported during 2017 include: the Fort McMurray Fire Department, Bonnyville Regional Fire Authority and Bonnyville Firefighters Association, Wrentham Volunteer Fire Department (Medicine Hat), Beaverlodge Firefighter’s Association (Grande Prairie) and the Edson Fire Department. 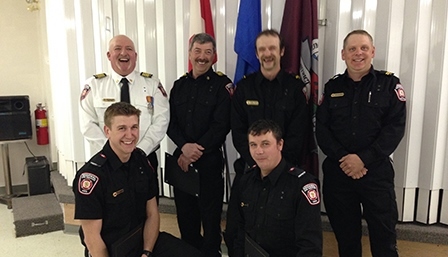 Rees Lusk, LLoydminster Operations Superintendent (third from left) with members of the Britannia Fire Department. Canadian Natural employees are pulling double duty in our Taber operations in Southeast Alberta, with 80% of the Hays Volunteer Fire Department (eight out of 10 members) reporting to work, and their chief being in charge, at the Hays natural gas plant. “Canadian Natural is a great community-minded business so it makes sense that so many of us are heavily involved in the community,” explains field foreman Jim Yaroslawsky, who has been doing this for 30 years. In March 2017, the team achieved the National Fire Protection Association (NFPA) Level 1001 certification. Now they are working on their Level 1002, which includes hazardous materials training and major Emergency Response Plan (ERP) capabilities. The NFPA certification program was introduced to ensure that all fire departments had the same standard of training. The hamlet of Hays has a steady population of 163, with roughly 500 more in the surrounding countryside. In 2016, our oil sands employees played a major role in helping each other and the communities where they live and work that were affected by the wildfires in Fort McMurray. Canadian Natural was part of a massive regional effort to welcome and assist evacuees, as well as help the Regional Municipality of Wood Buffalo fight the fires. Read how we แอพพลิเคชั่นเกมยิงปลา W88joined forces to help Fort McMurray. Canadian Natural is part of the แอพพลิเคชั่นเกมยิงปลา W88Regional Mutual Aid Emergency Response Organization, a formal partnership that pools resources for emergency response. 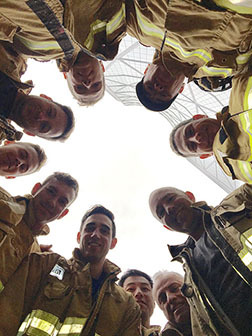 A group of Canadian Natural’s Horizon firefighters became the ‘Top Fundraising Team’ during the third annual 2017 Firefighter Stairclimb Challenge at the Calgary BOW Building, raising funds for Wellspring Calgary, a non-profit that supports those living with cancer. Canadian Natural’s 2017 Stairclimb Challenge participants: Clayton Bowman, Marc Gervais, Trevor Greene, Tao Liu, Tyler McLellan, Ian McLeod, John Penzo, Geoff Pyke, Trevor Remington and Chris Study.